Mexican clay BBQs are efficient and nice to look at. No need for roaring fires, the clay becomes hot and radiates the heat. It is important you observe the instructions and maintenance recommendations. Not all fuels and lighting fuels can be used in Mexican BBQs and they will need protection from the weather. Mexican BBQs are hand-made and hand-painted, so shapes and colours may vary slightly. The paint finish on this BBQ will discolour and burn off when fired or if left outside all the time, even without firing. Colour changes do not affect use or functionality. Mexican BBQs can be repainted. Metal stands will rust. Packing Size: 57cm length. 43cm width. 37cm height. Please read the following instructions and recommendations. Exercise CAUTION at all times for the safe enjoyment of a chimenea. Please keep these instructions in a safe place so you can read them again from time to time. ALWAYS FOLLOW THE USER INSTRUCTIONS Failure to do so may result in personal injury or fires spreading to property. Please remember you are dealing with a real fire. PLACE your chimenea on a FLAT surface; you should NOT place it on a sloping surface where it might tip over. This should be a NON-FLAMMABLE surface such as stone, gravel or bricks. Do not place on grass which may turn brown. Do not place on wood which may turn brown or catch fire. DO NOT PLACE ON DECKING which may turn brown or catch fire. You may protect wooden decking with a Gardeco FLOOR PROTECTOR or use bricks or concrete slabs. DO NOT place your chimenea near bushes or plants or under trees; the heat will damage the leaves and is a fire risk. DO NOT place your chimenea under an awning; it will burn or melt. DO NOT place your chimenea near garden furniture, especially made of fabric or woven plastic, which may melt or catch fire. We recommend at least one metre minimum distance. DO NOT make a real fire inside a conservatory, summer house or garden shed. Chimeneas burning wood,coal or charcoal can only be used outside, because fumes and gases from the fire are poisonous and dangerous to health. Carbon monoxide gas has no colour nor odour and is deadly. You can use your chimenea indoors ONLY WHEN USING WITH THE GARDECO CHIM BURNER AND BIO-ETHANOL FUEL. DO NOT touch the chimenea when burning, the surface is hot and you will burn your fingers. Protect your hands with a Gardeco FIRE GLOVE. We recommend that gloves are used at all times. DO NOT allow pets near the fire. DO NOT allow children especially small children to play or run around the fire. Use a Gardeco CHIMENEA GUARD to prevent small children coming close to the fire. DO NOT over fuel the chimenea. If flames are coming out of the top of the chimenea, then the fire is too large! DO NOT PANIC if fuel falls out of the chimenea or for any reason flames spread out from the fire,simply extinguish spreading flames with earth, sand or water or use a Gardeco FIRE BLANKET to smother the flames. DO NOT use petrol, paraffin or fire lighters to start the fire (or as a fuel). The best method is balled newspaper and dry kindling, such as Gardeco OCOTE sticks. The best fuel is wood or charcoal. NEVER LEAVE A BURNING CHIMENEA UNATTENDED Failure to do so may result in the fire spreading out of control and damage or destruction of property. Please ensure the fire is completely out before leaving the chimenea unattended. DO NOT attempt to move any real patio fire while the fire is burning. We advise against using a real patio fire when it is windy. Strong wind may tip over a chimenea which is a fire risk. Wind may disperse burning material, which is a fire risk, particularly if the surroundings are very dry. 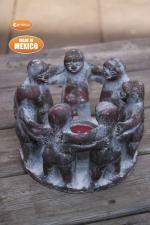 This is a genuine Mexican design handmade by craftsmen in Mexico. 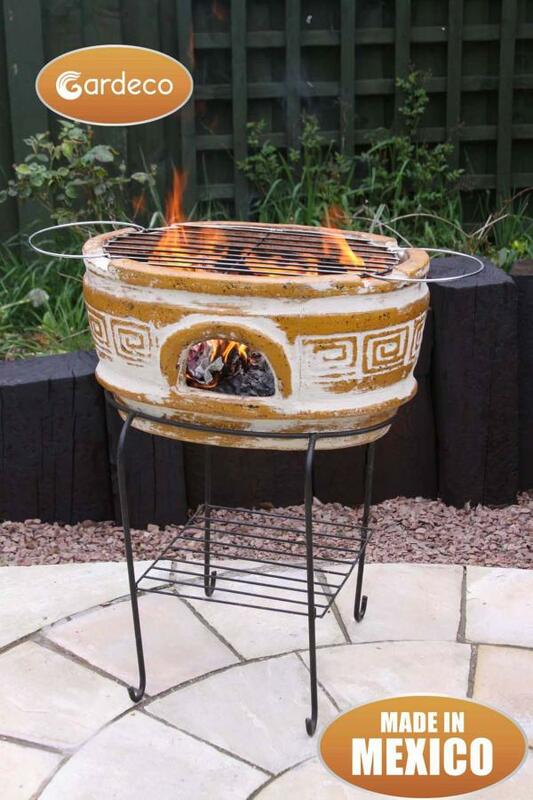 Use your clay chimenea for warmth and outdoor cooking. It is beautiful to look as a garden decoration. Clay chimeneas are like outdoor radiators, the clay is heated by the fire and gentle warmth will radiate out. It is not necessary to make a large fire, one or two logs is sufficient. You can cook on clay chimeneas. The belly acts like an oven, so barbecuing or cooking a pizza is quick and easy, so is using any of the Gardeco long-handled tools. Gardeco offer cast iron pots specifically designed to fit into the top of the funnel cooking stews and soups quickly. Clay chimeneas are fragile, so care needs to be taken to avoid damage. Clay chimeneas may CRACK, CHIP OR BREAK if dropped or knocked over or due to thermal shock or if left outside in the frost. To avoid dropping or knocking the chimenea over, handle the chimenea with care at all times. impact as possible. 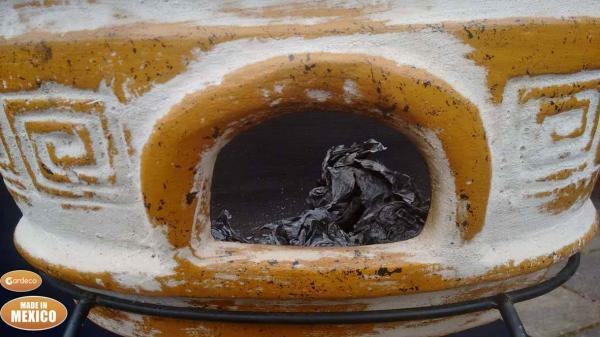 Dropping a clay chimenea, even from 5cm high may break, crack or chip it. If transporting it in the car, make sure it is not allowed to move around, and we recommend the addition of blankets or bubble-wrap. High winds may tip the chimenea over, so be mindful of where it is situated and how to avoid this. Similarly, do not bang into the chimenea with hard or heavy objects. Do not throw fuel into a clay chimenea. The impact may crack the clay or tip the chimenea over which is dangerous. Do not drag or move a chimenea on its stand: it may fall off and break. To move a chimenea, lift it off the stand, re-position the stand, and lift the chimenea back on. Gardeco supply special wheeled stands for larger chimeneas, so they can be moved around without having to take them off stands. THERMAL SHOCK is a technical terms used to describe clay cracking due to the heat of the fire. - Before lighting, put 50 mm (2 inches) of Gardeco LAVA STONES or sand/gravel in the bottom to protect the base from direct heat. Failure to do this may crack your clay chimenea. - Start the fire with balled newspaper, dry kindling or Gardeco OCOTE sticks. NEVER use petrol or spirit based lighting fuels. They may crack your chimenea. - Do two or three small fires at first. This cures the clay, making it harder and more resistant to thermal shock. The more your chimenea is fired, the harder the clay becomes. - It is essential to allow the clay chimenea to warm up slowly by keeping the fire small for the first 20 minutes (even after initial curing). Add more firewood but do not build a large roaring fire which may crack the chimenea and is dangerous. - Thermal shock may make apinging sound, and vertical or horizontal cracks will appear. Large cracks may render the chimenea unsafe and we recommend that chimeneas with large structural cracks not be used for fires. - Thermal shock is not dependant on the age of the chimenea or the number of times it has been used and may occur on the first firing. FROST DAMAGE including chipping or cracking may occur when Mexican chimeneas are left outside in the winter without protection or a cover. Clay is a porous material and absorbs water. If the chimenea is water sodden and the temperature drops to below zero degrees Celsius, the water inside the clay will freeze and expand and crack the clay. This is a natural phenomenon which cannot be prevented. - Bring it inside, out of the frost, for the winter. 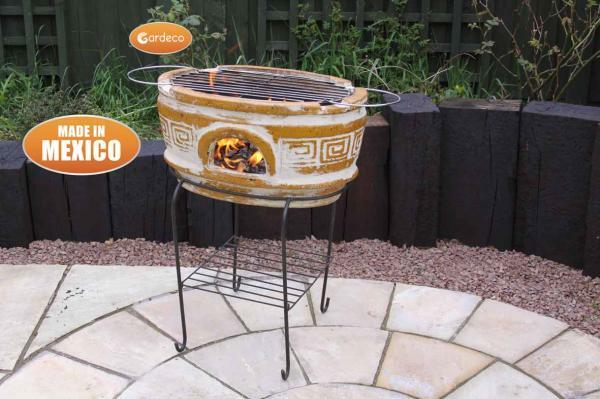 - Protect the chimenea with Gardeco CHIM-PROTECT: this makes the chimenea less porous but is not a 100% guarantee if left un-protected. 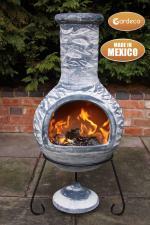 - Cover the chimenea with a Gardeco CHIMENEA COVER if you cannot bring it inside. Make sure the chimenea is dry before covering it up, otherwise you will be enclosing the moisture. Gardeco supply many covers suit able for all chimenea sizes. -Use a Gardeco WINTERCOAT which is a padded cover. This will help prevent the chimenea freezing and is a much better protection than the standard cover. - Frost damage can be repaired with Gardeco CHIM-FILLER, a type of fire cement. Mexican chimeneas do not like to be left in a damp environment for too long. It weakens their structure. If your chimenea has been allowed to become sodden with rainwater for a while, or has been kept unprotected in a cold and wet environment, wait for it to dry before using. 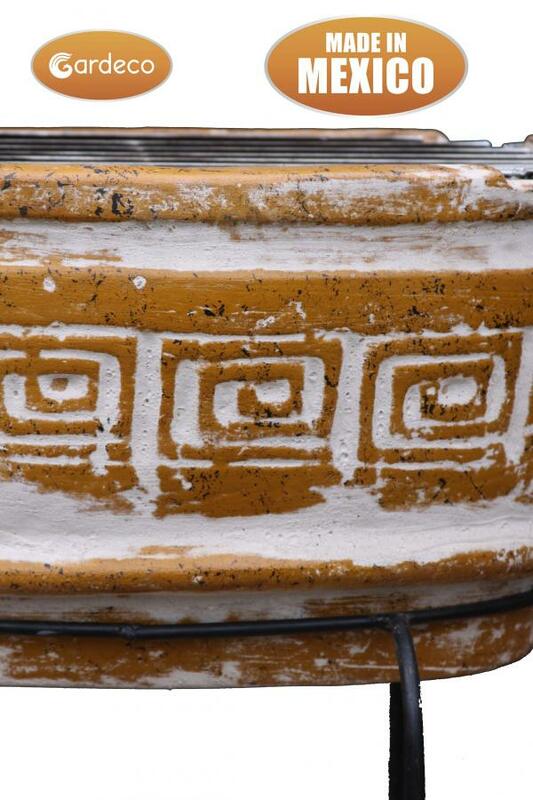 Gardeco offer no guarantees against cracking of clay chimeneas and will not exchange or refund cracked products. You may use dry wood logs or charcoal fuel. 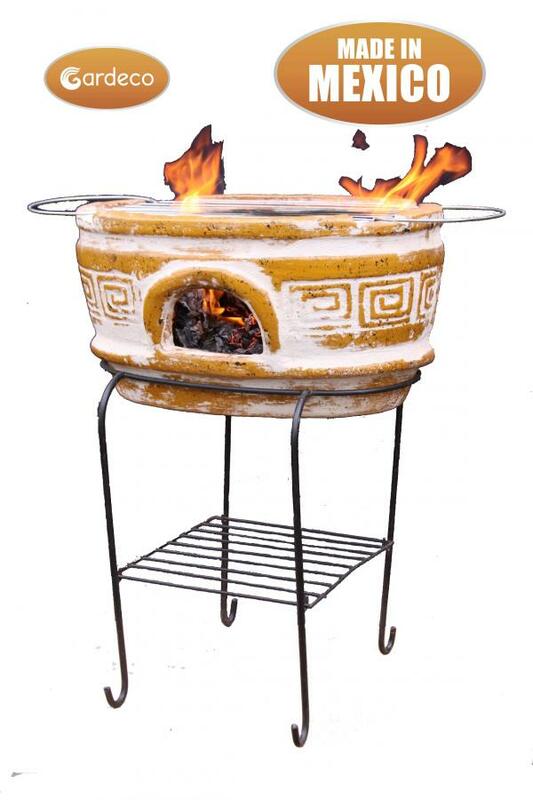 Clay chimeneas and other patio fires can be used to burn garden refuse such as leaves or branches. Wet logs will create a lot of smoke, use seasoned or kiln dried wood to minimise smoke. When cooking use locally made charcoal from renewable forests with minimal transport cost. Gardeco Wyre Forest Charcoal is made in the Wyre Forest in the UK West Midlands following ancient rural methods. Gardeco CHIMLOGS, which are made from recycled sawdust and burn slowly with little smoke. For a fire without firelighters or kindling, use the Gardeco FIRELOG (smokeless fuel), a wax impregnated sawdust briquette, wrapped in a paper. Just light both ends of the paper and the log will burn for about 2Â½ hours. Do not use Gardeco Fire Logs for cooking. If the fire is slow to start, more air will help, use a Gardeco BELLOW to blow extra air into a slow fire. Safety is our main concern, so please use a CHIMENEA GUARD to keep small fingers away from the fire. With use the paint finish on your chimenea will change and discolour, and there will be blackening around the rim. The bigger the fires, the faster the paint finish will change. 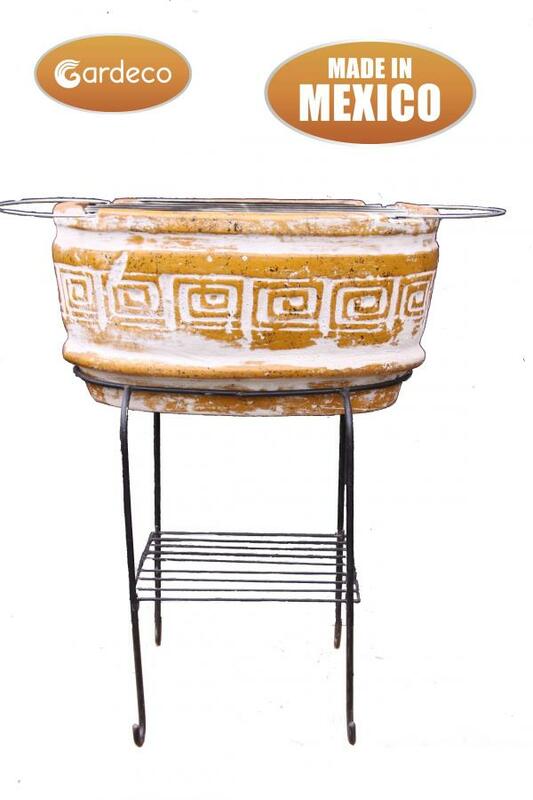 A clay chimenea can be re-painted with ordinary household emulsion paint after removing any loose paint. The shiny gloss effect paint finish will peel and burn when heated to a high temperature and will peel off if left outside in the winter. Gardeco offer no guarantees on the paint finish. The stand is made of steel and will rust. To reduce the likelihood of rusting bring the chimenea and stand inside or protect with a Gardeco weatherproof cover. Ideally, bring inside for the winter. Stands can be repainted. Rust runs may mark flooring, slabs, and patios, so if you are worried about marking, protect your flooring. A discoloured chimenea on a rusty stand is still fit for purpose and can continue to be used. Cracks in the clay may be repaired with Gardeco CHIM-FILLER and continue to be used. If a large structural crack appears, stop using the chimenea and dispose of it or use it for decorative purposes. All clay chimeneas crack eventually. Bio-ethanol burns without smoke, soot or ash. Simply position your chimenea in an safe place in your house, and it turns into a real flame decorative heater! NEVER move your chimenea while the fuel is burning or when there is fuel left inside the Chim Burner. Special care and attention is necessary when cooking on a chimenea or fire bowl to avoid contamination by smoke or soot. All cooking accessories MUST BE THOROUGHLY CLEANED BEFORE USE. BBQ grills and accessories are coated with vegetable oil during manufacture but may have gathered dirt and dust therefore must be thoroughly washed in hot water and detergent, check all dirt is removed. After cleaning and drying, cooking accessories are best lightly coated with vegetable cooking oil before use. After use, they must washed clean with hot water and detergent and coated with vegetable cooking oil before storing. NEVER USE MINERAL OIL. If you do not oil cooking accessories they will rust, this could happen after first use. If you wash cooking accessories with water and dont coat with cooking oil rust can occur in a matter of hours. After use the surfaces of the cooking accessories in direct contact with the fire will be covered in black carbon soot. Soot can be washed off with hot water and household detergent or washing up liquid. Be careful because black soot residues will mark surfaces, tea towels or washing up cloths. All soot must be removed before oiling and storage. Only bring food out into the garden before cooking and it should be consumed after cooking as soon as possible. Food should be eaten while hot, immediately after coming out of the fire. Dispose of any cooked food not eaten. The materials used are suitable for the greater intensity of outdoor fires, with long handles to ensure ease of use without burning your hands. It is NOT ADVISABLE TO USE KITCHEN PANS OR POTS to cook on patio fires. Kitchen pans may be designed for fires of less intensity and coated with plastic based non-stick materials which may melt in patio fires. Gardeco cooking accessories are designed for cooking food on an open fire. The Gardeco COOKING IRON is perfect for burgers, sausages, vegetables; it is multi-purpose. Your cast iron or steel chimenea may already be equipped with a SWIVELLING BBQ GRILL, made of either chromed steel or cast iron for barbecuing on your chimenea. These can also now be purchased separately from the chimenea. All cooking accessories, whether supplied with the product or separately must be washed before first use to remove any dirt due to manufacture or packaging operations. We recommend you wash them before use every time subsequently, even if they were put away clean. which is harmful to human health. For cooking accessories purchased separately from this product, follow the cooking instructions supplied with the packaging.